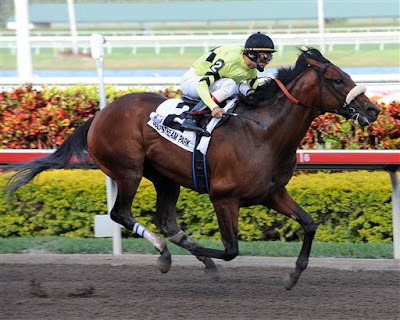 THE KENTUCKY DERBY – Edward P. Evans’ QUALITY ROAD made a big statement about his ability winning the Gr.1 Florida Derby in track-record time over the previously undefeated high-dollar yearling Dunkirk. Looks like Churchill Downs may be the next stop for the talented three-year-old. The last Virginia-bred to win the Derby was Sea Hero who wore the blanket of roses back in 1993. G. B’s Girl (f, 5yo), Aaron’s Gold – Fancy Mix by Cherokee Colony. B – Charles Grimsley. 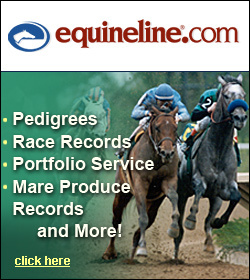 Laurel Race Course, 3 /25/2009, mdn clmg, winner’s share of purse: $6,840, 7 f, 1:27.22. Jenkin Jones (g, 7yo), Malibu Moon – Cautionary Tale by Caveat. B – Country Life Farm. Charles Town, 3 /26/2009, clmg, winner’s share of purse: $12,900, 7 f, 1:27.38. Virginia-bred Quality Road turned back a bid from even-money favorite Dunkirk in upper stretch and drew away for a sensational 1 3/4-length victory in the $750,000 Florida Derby (gr. I) March 28 at Gulfstream Park. The son of Elusive Quality set a new 1 1/8-mile course record in 1:47.72. 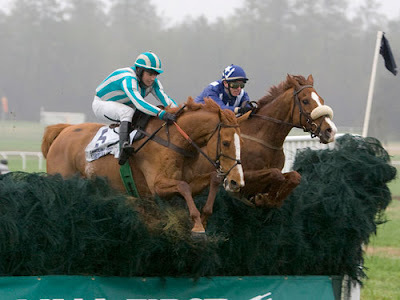 Looking as powerful as ever, two-time defending steeplechase champion Good Night Shirt overwhelmed Preemptive Strike in the stretch to win the $75,000 Carolina First Carolina Cup at a rain-drenched Springdale Race Course Saturday. BIG PAYDAY. Jockey Aaron Gryder gives a big pat to Well Armed, owned by WinStar Farms LLC, as they win the 6-million-dollar Dubai World Cup race in the Gulf emirate on March 28, 2009. Well Armed improved from third last year to run out the easy winner of the $6 million Dubai World Cup, the world’s richest race. A FAMILIAR CELEBRATION: Jockey Lanfranco Dettori celebrates after leading US contender Two Step Salsa, owned by Emirati Vice President and Dubai ruler Sheikh Mohammed bin Rashed al-Maktoum, to win the Godolphin Mile race at the Dubai World Cup in the Gulf emirate on March 28, 2009. 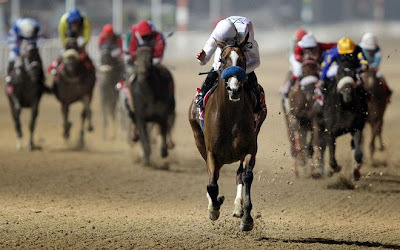 The Dubai World Cup is the world’s richest horse race with prize money totalling $21.25 million. 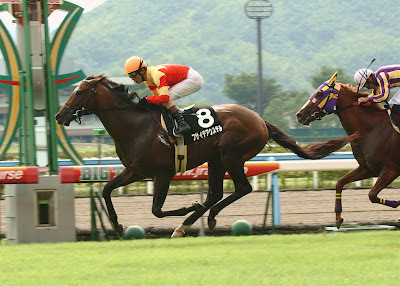 FUSAICHI AUSTER (left), 2002, h., by Stormin Fever, out of Gender War by Green Dancer, $464,981, WON: Miyako Oji Stakes, Yonago Stakes. Bred by Edward P. Evans. 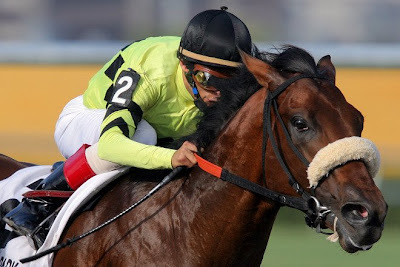 SIR WHIMSEY (below), 2004, h., by Jump Start out of Apogee by Star De Naskra, $287,834, WON: Gulfstream Park H. Gr.2, 3rd Maryland Lottery Pimlico Special Handicap Gr.1, Ben Ali S. Gr.3, Count Fleet Stakes. Bred by Chance Farm. 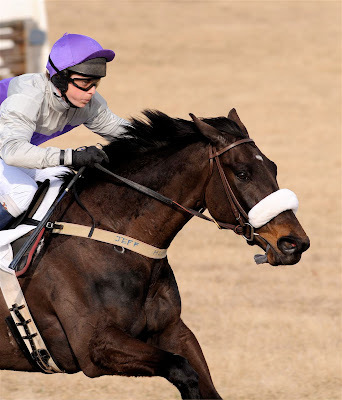 Northfield Farm, LLC’s Expel captured his second win the VHBPA Virginia-Bred/Sired Series when he captured the $2,000 restricted event at the Piedmont Hunt Point-to-Point. The five-year-old gelding by Expelled, out of Kentwood Miss by Our Native covered the ten furlongs in 2:06 over the firm turf. Expel grabbed the lead from runner-up Roseville Run in the last furlong and cruised home for a 1 ½ length victory under rider Jeff Murphy. Jacobs Entertainment, Inc. (“JEI”), an owner and operator of multiple gaming properties, today announced financial results for its fourth quarter and year ended December 31, 2008. Net revenues for the fourth quarter of 2008 were $81.4 million compared to $82.9 million in the fourth quarter of the previous year. Net loss for the fourth quarter of 2008 was $2.9 million compared to net loss of $1.1 million in the same quarter of the previous year. Virginians Len and Ellen Kill Kelley are TOBA’s newest members of the month. TOBA members since 1994, the Kill Kelleys own and operate their 25-acre Sea Jay Farm in Nokesville, Va.